You can't have one without the other: water, headgate, canal, dam, power plant. Originally named Waluga Lake, then Sucker Lake and finally Oswego Lake in 1927, the body of water at the heart of modern-day Lake Oswego is a result of the Missoula Floods. It is fed by creeks, springs and drainages (both natural and manmade), supplemented seasonally by water from the Tualatin River that flows into the lake via the manmade Oswego Canal at the western end. 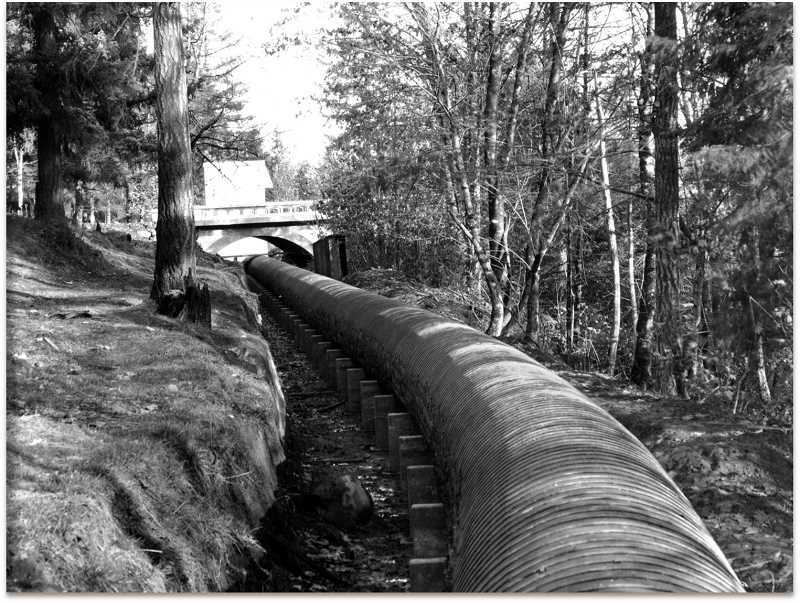 A dam located at the east end controls the flow of water from the lake into the Willamette River. Some of the water is diverted into a power plant via a large penstock — an enormous circular pipe used to carry water to a turbine — where electricity is generated. The power plant, built in 1909 by Oregon Iron and Steel, was the brainchild of OIS shareholders as a means to several ends: generating electricity for the iron pipe and foundry business; reselling the electricity to improve cash flow; and maintaining their water rights. The company owned the Sucker Creek dam and Sucker Lake water rights, but in order to retain those rights, the water had to be used for industrial purposes. With the cessation of iron production in 1894 and commerce almost at a standstill, those rights were in jeopardy of being lost. Nathanial S. Keith was hired to investigate how feasible it would be to build a power plant in Oswego. Keith, a well-known electricity expert from New York, gave Oswego high marks as a location for a power plant, which became known as Oswego Hydro. Now referred to simply as the power plant, it is owned and operated by the Lake Oswego Corporation, as are the dam and headgate. Oswego first became 'electrified' in 1910. The power plant is located just below the McVey Avenue bridge. Looking at the very square concrete building, you would never guess that inside is a massive turbine — a Westinghouse horizontal water turbine with a 48-inch Francis double-cupped water wheel mounted on a 7-inch continuous shaft, to be exact. The manufacturer design plate reads. 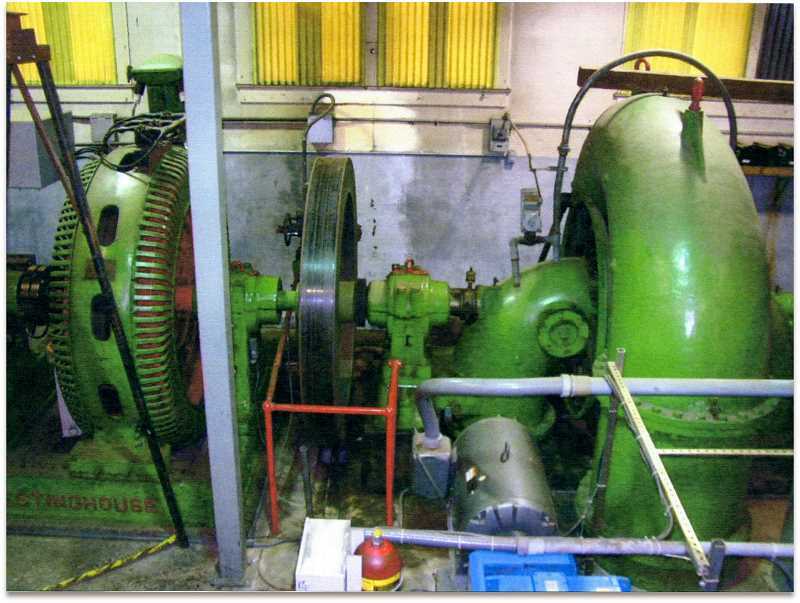 "Patent dates 1895-1905, 500 KVA unit, 2400 volt, 360 RPM and a 700-horsepower rated generator." This original Westinghouse turbine is operational today. However, it has always required people with the mechanical knowledge and technical skill to maintain and repair it. During the 1950s and 60s, this was not a problem; a handful of people could be called upon. But as of 2015, only one of that select group is still around: my brother, Stuart Dunis. (An obvious dot connection.) He worked for the Lake Corporation for 16 years, spending many hours working on the turbine. Two years ago, in an attempt to get the turbine back online, Dunis made a special part while waiting for the one he ordered to arrive, just so the power plant could resume generating electricity quickly. After 1955, it was no longer necessary to man Oswego Hydro 24/7, but twice-daily checks were still being done. Others who made it possible for the 1905 hydro unit to stay online include Carl Halvorson (Dot connection: His daughter was another classmate of mine, and he developed Mountain Park), machinist M. McCarty, BPA engineer L. Fisher and machinist and inventor S. Henderson. Electrician Bill Banks worked at Oswego Hydro in the 1920s. 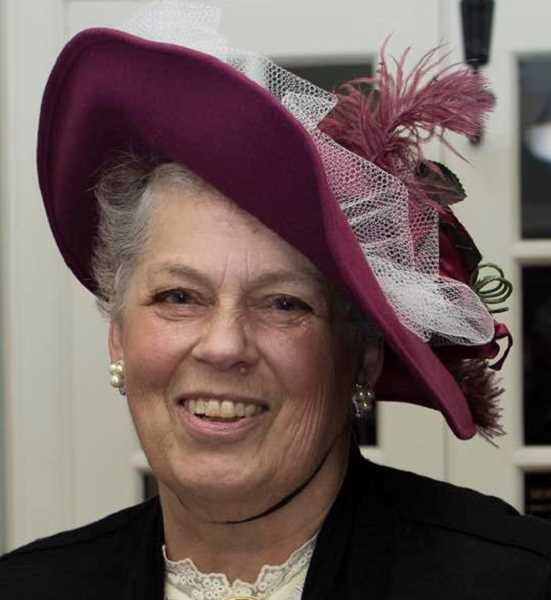 "One particular night," he told author Theresa Truchot for her book "In Their Own Words," "the doors wide open, a logging train had just gone by, and shortly afterwards I heard this groanin' sound. It went on for hours until daylight. Then daylight came and I spoke to my relief operator, 'It sounded like somebody had been hit by that logging train from all the groaning that was going on.' 'Oh, those are just bull frogs out in the swamp.'" During his shift, Banks told Truchot, he would sit in front of a pot-bellied stove to keep warm. Dunis says you can still see the spot in the wall where the pipe from the stove carried the smoke to the outside.